An oval-shaped dining table dominates the living room of our family home. It’s the place where we eat our meals, yes. But there’s much more to that table. The dining table is where Baba* sits to sift through the daily mail and at the end of the month, attempt to make sense of my expenses. The table is where Maa prefers to solve the newspaper puzzles and crosswords. It’s my choice of seat with a cuppa as I read through gossip pages of newspapers or drool over the magazines I subscribe to. The table is where we dissect the ‘who said what’ and ‘why they said what they said’. It’s also what Maa has dubbed the ‘dumping ground’. Our dining table is littered with flyers that slipped out of newspaper pages, newspapers, grocery lists, spectacles, pens, phones and containers of various sizes. These containers, interestingly, hold a rather elevated position in the household. Because, dear fellow foodies, these containers are filled with pickles, mouth fresheners, organic digestive aids, baking results, savoury snacks… you get the drift? These containers or tiffin kouto – as we call them in Bengali – have their own version of musical chairs. Or should I say musical spots? As soon as the contents of one container are polished off, another filled kouto takes its place within a day. Most containers tend to stick around for at least 4 to 5 days. But there is one kind that is never around for more than a day. And that is a kouto filled with ‘nimki’. 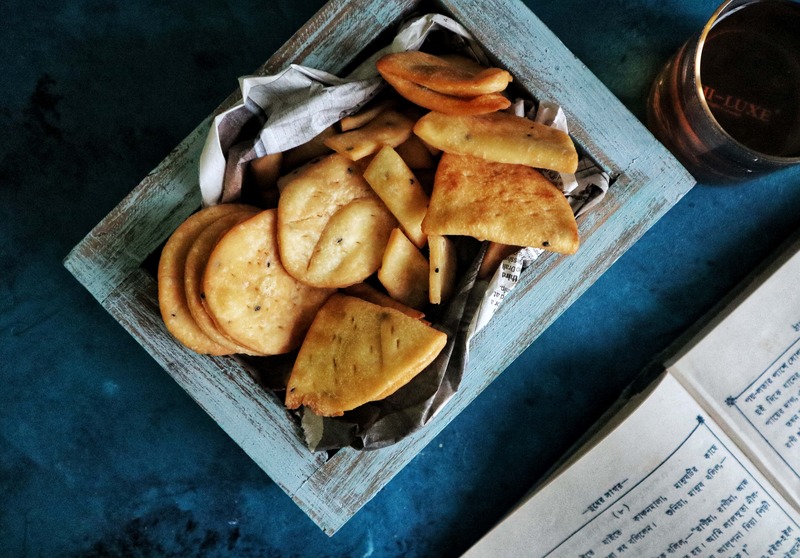 A Bengali’s favourite savoury snack after the jhaal mudi, these savoury crackers are the perfect crunch with your evening chai*. Or, in my case, the munching partner I need when watching a movie or trying to find the right word to express my emotions and devotions. You will find variations of the nimki across India, each region identifying this snack with a different name. I tried making the nimki in all three shapes and I must say the kucho nimki turned out to be my favourite version to make. Could it be because I loooooooove kucho nimki – they are the easiest to gobble down. There’s not much to be done here – dough, roll, fry, store. So let’s get kneading and rolling, shall we? Pssst… make this snack to store at office, home or as the next movie marathon munchy. Get ready to be addicted! And don’t forget to post a photo on social media and tag From The Corner Table on Facebook (click here), Instagram (click here), Pinterest (click here) or Bloglovin (click here). Add ghee, salt (as per taste), nigella seeds and cooking soda to the flour. Mix for at least 5 to 7 minutes till the flour is crumbly, with a sand-like texture. Gradually add water to the flour and knead well. The dough needs to be on the tighter side so be careful with the water. Divide the dough into small lemon-sized balls. For round nimki: Place a ball on a clean, flat surface or a rolling board. With a rolling pin, roll the dough into a circular disk, the thickness of a paratha. If you have trouble rolling out perfect rounds – like I do – use a cookie cutter or round bowl with sharp edges to cut out a perfectly round nimki. Take a sharp knife and make a few tiny cuts on the disk. This is done to ensure the disk of dough does not fill with air and turn into a puri. For three-corner nimki: Roll the dough ball into a circular disk. Run a sharp knife down the centre of the disk, dividing it into two parts. Fold one part along the straight line to join the two edges. With a sharp knife, make some tiny cuts on it. You will get a three-corner nimki. For kucho nimki/diamond-shaped nimki: For this you need a bigger disk so join two of the lemon-sized dough balls that you’ve made. Flatten the dough ball on the surface and roll it like chapatti or flat bread. With a sharp knife, make parallel lines. Repeat the action diagonally to get diamond shaped nimkis. Heat vegetable oil in a deep pan or kadhai, on medium flame. Once the oil is hot, slowly slide in the nimki. Deep fry on low flame till the snack is golden brown and crispy. Serve piping hot as a snack or cool and store in an airtight container, preferably a glass jar, for up to a week. The process of mixing the ghee and flour is crucial. This makes the snack crispy and fluffy. So don’t be lazy with your muscle work there. For a healthier option, replace the all-purpose flour with wheat flour. The nimki will be thicker. The cooking time will vary as per shape of the nimki – the diamond shaped smaller nimkis cook faster than the others. Be wary of the three-corner nimkis that end up with uncooked centres.